But I have to admit I’ve never heard of the Caves of Magnesia. I know. I know! This is way bigger than the original and is thus pixellating a bit. But after I had tried embiggening it I thought it resembled nothing so much as a Turner painting, and so I couldn’t resist leaving it this way. 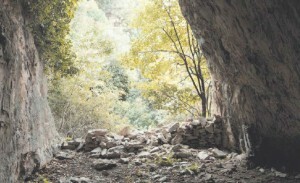 The most important finding was obtained in the “Cyclops” cave, where a systematic research has taken place. Part of a human sculpt of a female person aged 65-70 years-old intrigued the archaeologists who were surprised by her age, given that the average life expectancy was much lower. That’s right. No mention in the article of how they estimated the subject’s age, much less any reference to the age of the archaeological sites. Still, you have to admit that a cave named after the Cyclops has got to be pretty kewl. Bonus treat, if you’re visiting soon [in real time] after I post this, you might still catch a couple of program notes toward the bottom of the greekreporter.com‘s web page. I especially like the story about the Cretan ‘Mammoths’ [and no, I don’t mean intellectually challenged pachyderms]. True, they’re the same genus as the hairy behemoths they conjured up in Quest for fire, however I can’t stop smiling about the oxymoron that resulted when the English connotation was lost [obviously, I think] in translation. Seriously. Think about it. A dwarf mammoth? [written for grown-ups] about this Dumbo-sized creature. Gotta go do weekend-y evening things. Show your support for this blog. Remember that when you purchase from Amazon by clicking any of the links on the right, you’ll be getting great discounts and supporting the Subversive Archaeologist’s field activities at the same time! This entry was posted in Cave Milk, Caves of Magnesia, Crete, Cyclops Cave, dwarf elephant, Milk of Magnesia. Bookmark the permalink. ← Updated: 20th Century Fertilizer Mining in Wonderwerk Cave! 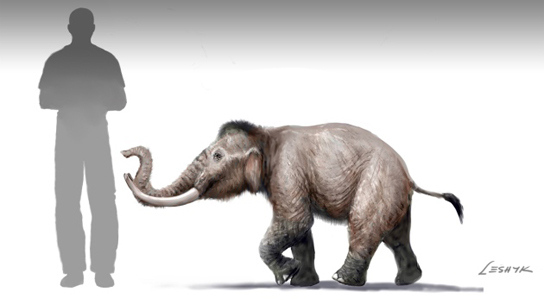 Yes, the diminutive Pleistocene mammoths of California's Channel Islands are typically called “pygmy mammoths”. Too bad none of these survived, they'd make interesting pets. They'd make better pack animals! Hmmm. Let's see. A segway or a pygmy mammoth? Tough decision. Segway's don't poop half as much, but I'll bet the elephant could outrun a segway and still be smart enough to avoid [most] pedestrians!